Japanese beetle, an invasive, regulated pest in Canada, has been discovered in the False Creek area of Vancouver. It can significantly damage landscape plants, ornamental plants, fruit and vegetable gardens, nurseries, orchards, and agricultural crops. As a result, the Canadian Food Inspection Agency (CFIA) has issued an order restricting movement of plant and soil materials from outside the CFIA-established regulated area in Vancouver. We have also been issued a Notice of Requirement to Treat or Process by the CFIA on behalf of the Province, to treat all lawns on public lands within established treatment areas. The official CFIA notice specifies that the treatment must use the larvicide product Acelepryn. This larvicide is approved for use in Canada by the Pest Management Regulatory Agency of Health Canada. It is also permitted under the City’s Health Bylaw Section 2.10 (f). All pesticides registered in Canada are thoroughly evaluated by Health Canada before they can be used. Acelepryn is considered a reduced risk pesticide by Health Canada and also by the US Environmental Protection Agency. Health Canada considers the risk to applicators, bystanders, and people accessing treated turf to be negligible. Acelepryn, and the active ingredient chlorantraniliprole both have a very low acute toxicity to mammals. The product is applied directly to the soil and ingested by the larvae of the beetle. The larvicide targets root eating grubs, and will not impact people, pets, mammals, birds, bees, butterflies or other animals. The priority treatment locations were identified by the CFIA and BC Ministry of Agriculture in collaboration with the British Columbia Plant Protection Advisory Council and are based on Japanese beetle detections in 2017. Over the coming weeks, the City and Park Board will be finalizing a schedule for when all locations will be treated. Some parks may need to be closed briefly following treatment. Japanese beetle (Popillia japonica) is an invasive plant pest that was first introduced to eastern North America from Japan in 1916. The larvae feed on the roots of turf grass and other plants and the adults are heavy feeders, attacking the flowers, foliage, and fruit of more than 250 plant species, including roses, blueberries, and grapevines. 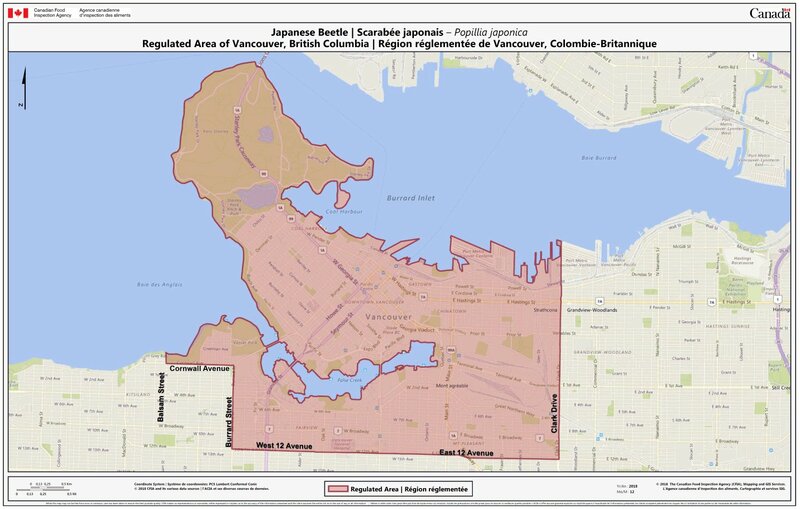 As the City recognizes the threat posed by the establishment of Japanese beetle in Vancouver, it is working collaboratively with the Canadian Food Inspection Agency, BC Ministry of Agriculture, industry and others to attempt the eradication of this pest from its landscape. Pursuant to the Plant Protection Act, the CFIA-issued order restricts movement of rooted plants and soil out of the regulated area in Vancouver year round to prevent further spread of the pest. There are also additional restrictions on plants and plant waste during the beetle’s flying season from June 15 to October 15. The CFIA on behalf of the Province also issued a Notice to Treat in order to eradicate the pest. The Province is overseeing a treatment program delivered by the Park Board. The treatment area includes pockets of public land and nine public parks in and around the regulated area. Visit the Ministry of Agriculture website for more information about the product being used for treatment.